Getting your price when you sell! As we start the new year, one thing remains the same…low inventory! As new listings come on the market, those searching for a new place to live will want to react fairly quickly as there are more buyers than there are condos for sale! If you are looking to sell, not a bad time to push price a little! Last night I went to an open house at The Waterfront Pearl. The listing was a beautiful 8th floor unit with sweeping views of the Willamette River. Stand at the windows in your living room and you feel like you are on top of the river! This unit, priced at $989,000, featured 1729 sf. As I viewed the condo, my first thought was that I wish I had a client with me as I felt it might be under priced at only $572 a sq. ft. While this building is not The Cosmopolitan or The Metropolitan and it will not command the same prices, I do believe this unit could get closer to the $636 per sq, ft. range which puts It closer to the $1,100,000 price tag. Compare this to 2 units left at Cosmopolitan. One is 1643 sq. ft. and priced at $1,559,000 ($953 sq. ft.). The other is 1363 sq. ft and priced at $1,197,000( $878 sq. ft.). Both of these units are on the 25th floor at the Cosmopolitan. While the Waterfront Pearl unit is not on the 25th floor and does not have 25th floor type views, It does have gorgeous river views and people rarely get tired of looking at the river traffic below your windows. To me it is kind of a wash in terms of views. So then, you have to ask yourself, are 25th floor views worth an extra $300 to $371 a sq. ft.? If you were to see the river views from the Waterfront Pearl unit, I believe your answer would be “No way!” . Those views were pretty stunning! searching for a new place to live will want to react fairly quickly as there are more buyers than there are condos for sale! If you are looking to sell, not a bad time to push price a little! Last night I went to an open house at The Waterfront Pearl. The listing was a beautiful 8th floor unit with sweeping views of the Willamette River. Stand at the windows in your living room and you feel like you are on top of the river! This unit, priced at $989,000, featured 1729 sf. As I viewed the condo, my first thought was that I wish I had a client with me as I felt it might be under priced at only $572 a sq. ft. While this building is not The Cosmopolitan or The Metropolitan and it will not command the same prices, I do believe this unit could get closer to the $636 per sq, ft. range which puts It closer to the $1,100,000 price tag. Compare this to 2 units left at Cosmopolitan. One is 1643 sq. ft. and priced at $1,559,000 ($953 sq. ft.). The other is 1363 sq. ft and priced at $1,197,000( $878 sq. ft.). Both of these units are on the 25th floor at the Cosmopolitan. While the Waterfront Pearl unit is not on the 25th floor and does not have 25th floor type views, It does have gorgeous river views and people rarely get tired of looking at the river traffic below your windows. To me it is kind of a wash in terms of views. So then, you have to ask yourself, are 25th floor views worth an extra $300 to $371 a sq. ft.? 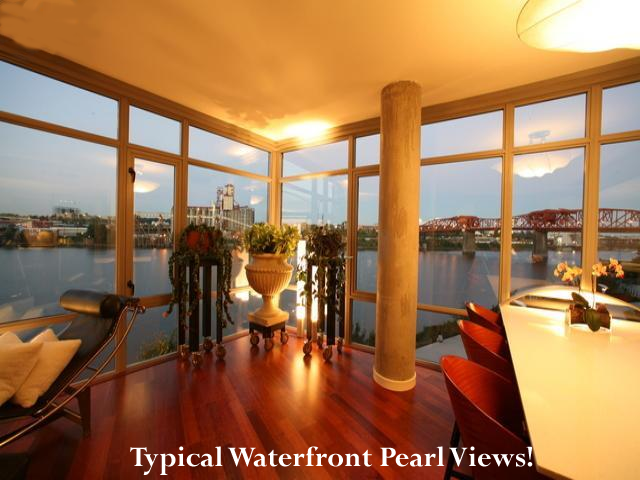 If you were to see the river views from the Waterfront Pearl unit, I believe your answer would be “No way!” . Those views were pretty stunning! If you are looking to sell your condominium in the near future, be aware of current inventory levels…this is so important. While comps will give you a good starting point, placing your condo in a side by side comparison with every condo in the price range is more important! Right now, for example, there are only 9 condos in the $900,000 to $1,100,000 price range and not 1 of those units competes well with the new Waterfront Pearl listing mentioned above! Does this strategy of pushing the price work? You bet it does! You may have to also sell the appraiser on your pricing, but a good agent should be able to justify his pricing. Another example of this strategy is the Cosmopolitan! The prices they attained happened for 1 reason and 1 reason only… no to low inventory!